Last summer I conducted an informal test of the idea of putting a voiceover microphone into a foam box to dry out the sound of the room. This seems to be an increasingly common technique for VO artists who don’t have easy access to a proper recording space. The first comment on that article was written by James Lindenschmidt of RealTraps, to suggest that their “Portable Vocal Booth” might yield results superior to my precariously-stacked box of discarded off-brand studio foam. James subsequently contacted me to offer a PVB for evaluation. I took the opportunity to compare the PVB to a couple other acoustic treatment products. Read on for the full review. 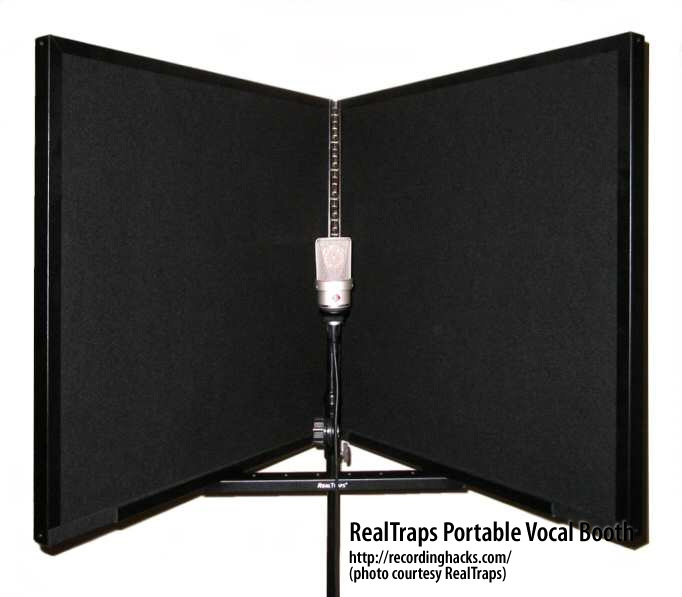 The RealTraps “Portable Vocal Booth” is a 2×4 foot acoustic panel with a hinge down the middle. According to Lindenschmidt, it is very similar to the company’s MicroTrap; both employ a limp-mass membrane and other sound absorption materials, suspended within a rigid metal frame. The PVB is designed to be folded into a “V” shape, with a microphone in the middle. 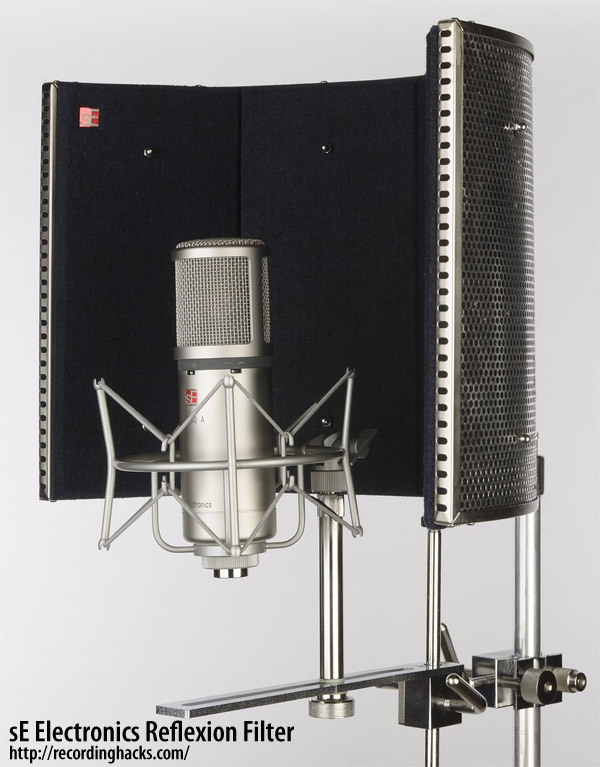 The PVB includes a metal track that allows the unit to be mounted on a boom microphone stand, with the microphone. I like this approach, because it means the height of the PVB can be adjusted simply by raising or lowering the mic stand. All my DIY foam enclosures suffered from an inability to be conveniently raised to working height, so I appreciated the convenience of the PVB’s design. For storage, the PVB can be folded in half. At two feet square, it’s not exactly unobtrusive, but it is not especially bulky either. The RealTraps website suggests that the folded PVB can be stored and carried in a pizza delivery bag. It could also be leaned against a wall, or in a corner, where it would provide additional absorption. The construction quality is excellent. The acoustic fabric was tight and even, without ripples or waves. After a half-dozen setups, the painted metal parts still looked new. My impression is that this device is solidly built and will provide many years of service. Setup is quick and easy; see RealTraps’ illustrated instructions here. Be sure the mic stand’s clutch is tight; at 11 pounds, the PVB weighs a good deal more than a microphone. The PVB can also be used without the V-rack — it is basically a small gobo, useful for surrounding a guitar or bass cabinet, or as a baffle between an acoustic instrument and a second sound source in the room. I suspect it would be useful at reducing the amount of bleed from a hi-hat into the room mics, too. 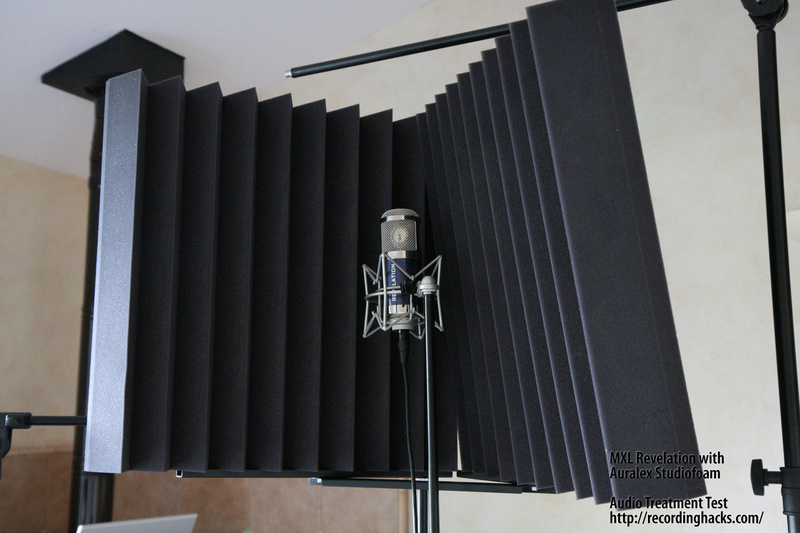 I tested the PVB against a couple other acoustic-treatment solutions. My pal Harry from Route 44 Studio loaned me a “Sound Absorption Sheet” from AudiMute. He keeps them around as portable, lightweight gobos. They’re inexpensive: $40 per sheet individually, or as little as $20 per sheet in quantity. I also have a cache of Auralex Studiofoam, which I figured I’d rig into another DIY foam box of some sort. Studiofoam panels are not sold individually, I believe; a box of six 2×4' pieces (48 square feet) costs about $360 without adhesive or any sort of mounting solution. The PVB costs $299 direct from RealTraps, and includes the mounting rack. The following samples were recorded from a distance of about 9 inches. As you’ll hear, I am not a voice actor, but hopefully the samples will serve as a useful demonstration anyway. An earlier round of tests at about 24 inches produced less-favorable results — none of the products performed adequately. This is due, in part, to the Inverse Square Law, which describes how the intensity of a sound wave will diminish over distance. By reducing my distance from the microphone, I gained over 6dB of signal level as compared to the volume of ambient and reflected sounds. In other words, at equal output gain, working closer to the mic makes the volume of reflected sounds a lot less audible. Also, by standing closer to the mic and whatever acoustic absorption product was deployed behind it, I reduced the amount of sound escaping from my virtual iso booth into the room. The closer a sound source is, the more effective absorption these products will provide. The first sample was recorded with no acoustic damping or absorptive products. The sound of the room is easily heard. It is big and ringy, and clearly unsuitable for voiceover work. 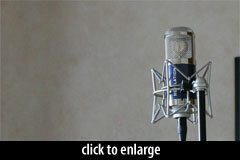 The second sample was recorded with the AudiMute sheet behind the microphone, draped over a tall boom stand. The vocal sound with this setup is definitely cleaner than before. I can hear the sound of the room, but it is more controlled. The echo is less sharp. If I’d had a second AudiMute sheet placed at a right angle to the first, forming a “V” around the microphone, the results would no doubt have been better. The large size of the sheets works in their favor. The third sample was recorded with the PVB. I set it up with the mic deep in the crotch of the “V.” I was standing within the “V” as well, to reduce the amount of sound leaking into the room. I think this sample sounds great. My voice is significantly drier than in the earlier samples. I could use this sound for a vocal track. In fact, I’ve already done so. 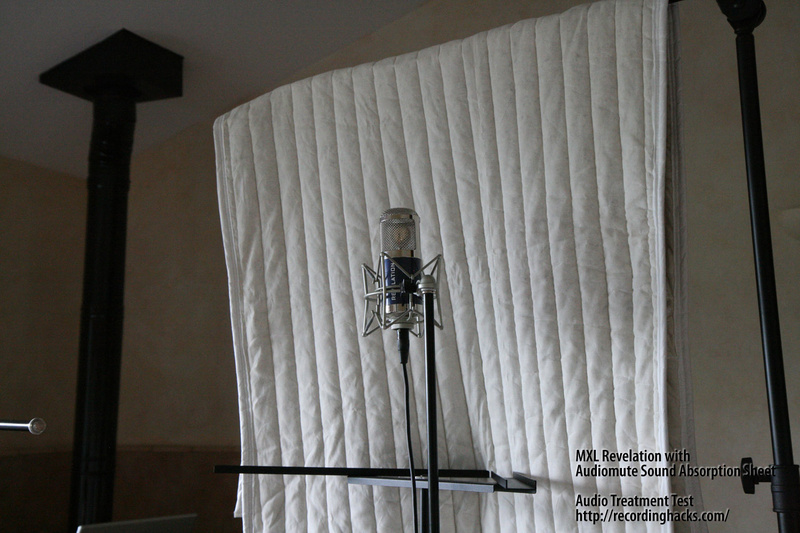 Did the PVB turn my 420 square foot, cathedral-ceilinged live room into a real vocal booth? I welcome your comments on that question. I can still hear a bit of presence from the room, but the improvement is remarkable. The fourth and final sample was recorded with a pair of Auralex Studiofoam panels, again in a “V” shape — I actually just stood the foam on the PVB’s mounting rack. The quality of the resulting audio is excellent. In a blind test, I couldn’t distinguish it from the audio sample recorded with the PVB. That said, without the PVB rack, it would have been hard to get the foam into position. My earlier DIY solutions suffered from the same problem — there’s just no easy way to suspend a foam box six feet in the air, although you can certainly kill your session’s momentum by trying to. Just as with my earlier foam-box test, this process proved that it is not necessary to record vocals in a dedicated vocal booth. For most applications, bad room sound can be sufficiently mitigated with portable absorption products. To my ear, the PVB delivers on its promise of allowing the user to capture a dry vocal sound even in a challenging acoustic space. I love the product’s design and its versatility, and I can imagine numerous uses for it — so much so that I bought the evaluation unit. I’ve since recorded vocals and harmonica for two local artists in this space, with excellent results. The PVB looks good. It sets up quickly. It is undemanding when in session. And it works as advertised. I wish I could say that about the rest of my gear. I couldn’t help but notice that RealTraps and sE Electronics have published some critical comments about each other’s products. I did not compare the two products, but I find the opposing claims fascinating. sE goes on to state that putting a “simple V shape behind the mic… creates one of the worst coloration problems you can manage to achieve.” To which RealTraps would probably reply that a V shape built of highly absorptive material doesn’t cause coloration at all, because coloration is caused by reflected sound. Ultimately, the only way to determine which one might work better for your application is to try them both side-by-side. Note that both products have been well-reviewed in the past, and both products cost the same ($299). I have no affiliation with MXL, Audimute, Auralex, or RealTraps, and received no compensation for this review. As mentioned previously, the Audimute sheet was loaned to me by a local studio owner. The MXL Revelation and RealTraps PVB were loaned to me on a fixed schedule by their respective manufacturers. I purchased the Auralex Studiofoam through a large catalog retail business about 10 years ago. A hearty hat-tip to JWL and Ethan at RealTraps, Mary Ann at MXL, and Harry at Route 44 Studio for their assistance! Well done! 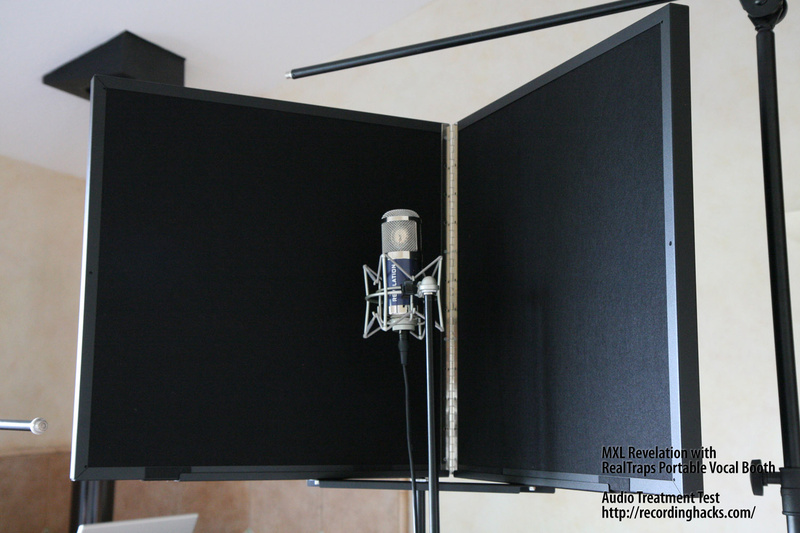 I wonder how the Portable Vocal Booth would have worked with your high ceilings if you had put an absorptive “lid” on it. Or rotated it for use vertically. I did record a test with a lid on top of the PVB — I laid a piece of Studiofoam on the top. I didn’t hear a significant improvement as compared to the PVB with no lid. If there’s other interest, I can post that sample for comparison. The drawback I see to these devices is a voice-over artist trying to read his script. It’s hard to tell from the photos. Are you able to step back enough to see something on a stand without getting the room creeping in? Jenni, thanks for the nice comments and for making such a useful distinction between the products in the review. 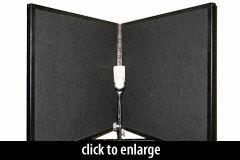 I have heard a vocal booth treated with Audimute sheets, and it sounds great. 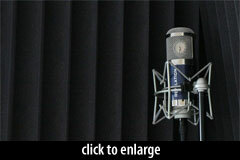 I like the Audimute sheet products — and you certainly can’t beat the price. I’m a little late to the dance, but admire the review nonetheless. Thanks, Matthew! 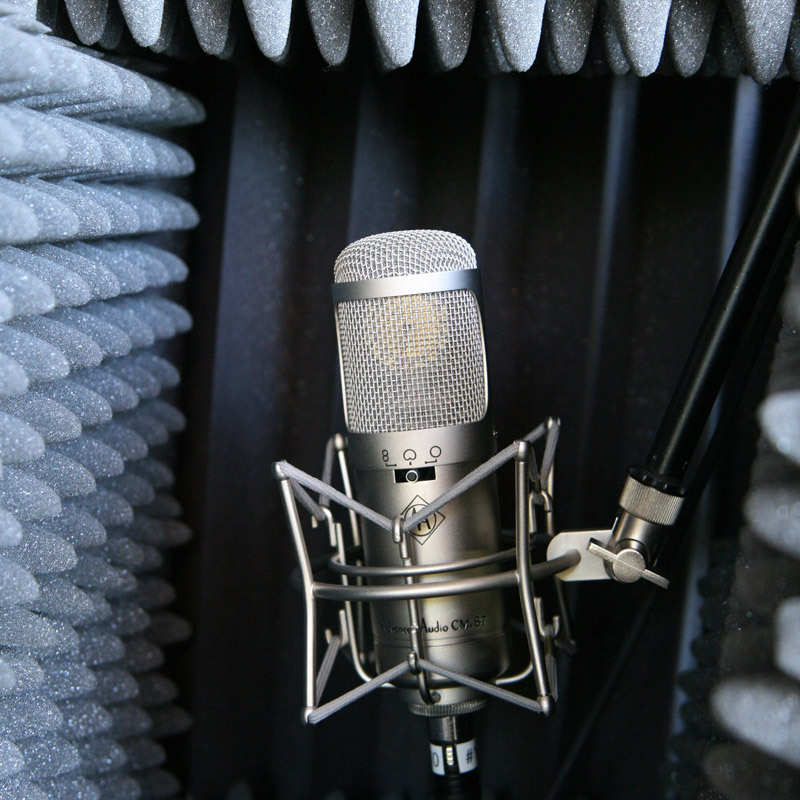 – With all kinds of absorption products, my question has been the same as Steve Faul’s about copy placement for voice talent. Did you (or anyone) have any thoughts on this issue? I narrate and produce audiobooks, and those fistsful of pages heighten the problem manyfold. – Any idea how the PVB does with low-range frequencies? Audimute’s site says that their sheets handle high and mid ranges. Haven’t found anything yet re: PVB. Demos of both sound terrific, but none sample the voice-of-God quality some of my guys bring to my “cozy” booth. Judith, there is no question it would be easier to manage many pages of copy in a real vocal booth, where you have space to move around and hold things. I guess I’d argue that if you’re doing that much narration work, you can justify the expense of a dedicated space. 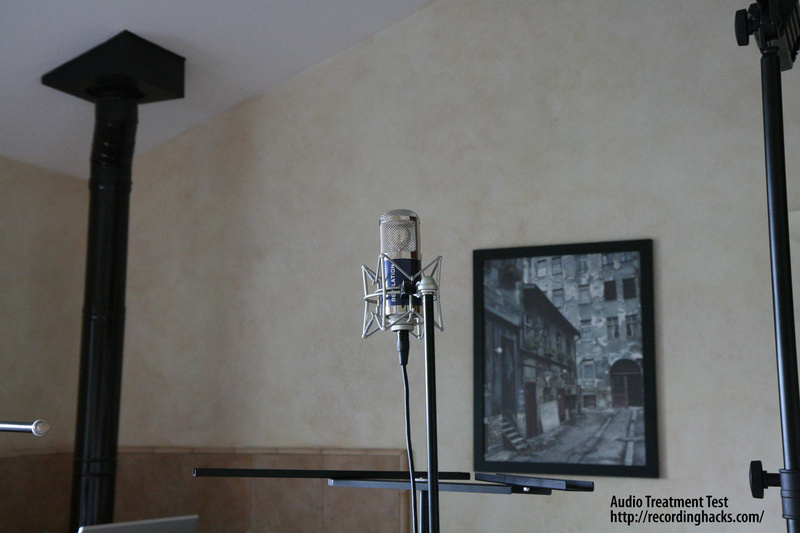 The PVB wasn’t really designed for dedicated VO work, but rather to set up quickly when you need a drier vocal (or instrument) sound than your room gives you. Or, buy an iPad and read the copy from there. Use any font size you like, avoid the rustling noises and page management issues. Win-win. Regarding low frequencies, I think most of that “voice of god” is due to proximity effect, no? Meaning, I’m not sure even a deep-voiced speaker will be producing significantly more low-frequency information than I am. In any case, low-frequency absorption depends on mass. The PVB panels are significantly more massive (heavier and thicker) than the Audimute sheets are. 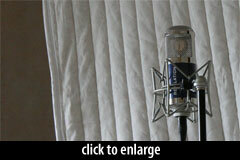 I will use both, the PVB behind the mic and the Audimute Acoustic sheets behind the singer. Even later to the party! I record 90% or my voiceovers using the SE Reflexion Filter which I have found to be excellent and my clients have never complained! Google me and listen. They’re pretty much all done with the SERF. I haven’t tried any of the other products as having started with the SERF in 2008, I didn’t see a need to change. However I like the idea of putting a Real Traps V screen behind the SERF just to allow me to be a little more flexible in moving my head. One criticism I have had with the SERF is script placement as putting the script to one side or the other, or above the mic means my head is angled differently and this actually changes the quality of the sound. 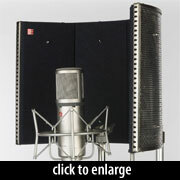 ( I have actually had problems in studios where they use a huge pop shield which obscures one eye’s view of the script). The iPad idea is a good one, but I find it gets a bit heavy. Since moving over to using a Galaxy Note smartphone to display scripts, I find that my problem has gone. One obvious issue with any of these portable sound booth solutions, is that you can’t block out unexpected sound interference coming into the room – a lawnmower, a lorry rumbling past, people coming into the room, a phone ringing in the house, my dog snoring (haha) etc. That’s when having a full size proper vocal booth wins hands down. In a pinch- I’ve gotten fair results by standing my couch on end and setting a mic stand on the arm. It’s better than nothing and actually does knock out quite a bit of unwanted room noise. In our experience whenever recording in a room with echo, devices like the SE Reflexion Filter only brings minimal reduction in the echo. We now use a 4 x 2 foot wood box lined with thick sound proofing with the microphone positioned inside with the script and light. A thick blanket sits over the speaker. This is the only way we have found to stop echo in a room without using a complete sound booth.